Canada's top general is forcefully rejecting the notion that Canada's new peacekeeping commitment isn't in line with the Liberal government's initial promise. Gen. Jonathan Vance, Canada's Chief of Defence Staff, argues that the plan outlined days ago by Prime Minister Justin Trudeau in Vancouver is consistent with what was first discussed 14 months ago, when the government committed to providing up to 600 troops and 150 police officers for United Nations operations. The plan unveiled on Wednesday called for up to 200 ground troops, transport and armed helicopters, cargo planes and military trainers for future United Nations peacekeeping operations. "There was a tendency to grasp at the number 200: 'Well, they said 600, now it's really 200.' 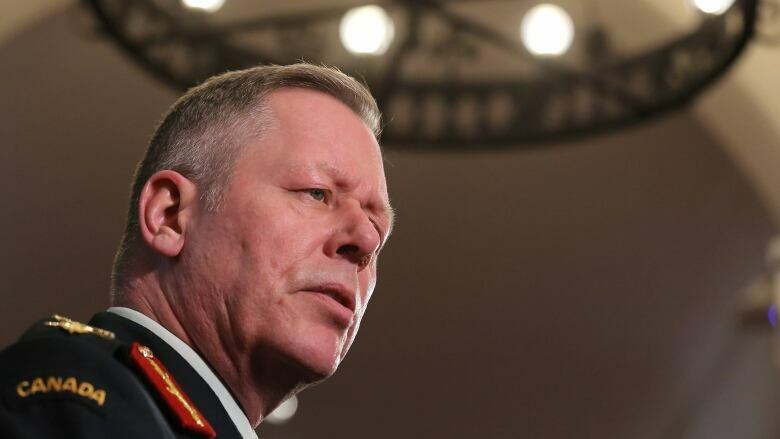 That's not true, that's one smart pledge," Vance told CBC Radio's The House from the Halifax International Security Forum. Trudeau has said he wants Canada to make "smart pledges" around peacekeeping. "A mythology was created that had never been part of what we said, had never been a part of a mission description," Vance added. The government's plan presented this week includes providing equipment, training, and a rapid-response unit of Canadian troops that would be called upon by the United Nations to fill gaps on certain missions. "We are making these pledges today, because we believe in the United Nations and we believe in peacekeeping," Trudeau said. "What we will do is step up and make the contributions we are uniquely able to provide.". The government was criticized for seemingly falling short of their initial promise. Following the announcement, the NDP's foreign affairs critic Hélène Laverdière told The House that the Liberals had not lived up to their word. "One has to wonder what they've been doing for the past year," she said. Her Conservative counterpart Erin O'Toole was also critical. The plan "was a shameful display of trying to hide a broken promise," he said. He explained that as he was looking at options to present to the government, one of the criteria he was asked to consider was the desire to improve UN performance. "You don't improve UN performance by sending a 600 block of Canadians to one spot and operate there. You'll certainly improve the situation in that area, but Canada has an aspiration to improve the institution across multiple missions," he told host Chris Hall. Vance also rejected the popular notion that was circulating prior to the announcement that Canadian troops were going to be deployed to the West African nation of Mali. He says the military did carry out research on a variety of options and locations, and that created a lot of noise in the media. But the country's top general says that once you factor in the various quick-response deployments and training missions, Canada's new peacekeeping blueprint will live up to what the Liberals first put on the table. "There will be 600… very likely 600 troops deployed doing that," he said.